Glow bracelets, sticks, and necklaces are popular items for kids. However, many parents are concerned about the liquid inside and whether or not it is toxic. Rest assured that these items are relatively safe, but of course there are some precautions to consider when using them for fun. Items that glow have delighted children and adults for years. 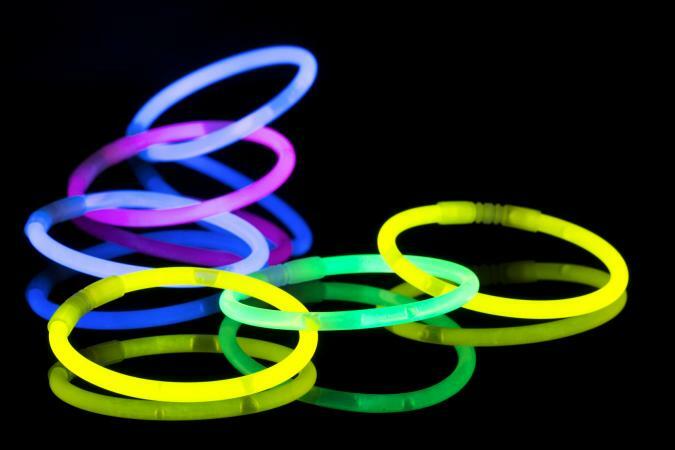 The question surrounding the safety of the liquid inside glowing sticks, bracelets, and other glow novelties often arises among concerned parents. People aren't just worried about their children either. The Animal Poison Control Center of the ASCPA receives masses of similar calls from concerned pet owners each year. With this overwhelming concern for public safety, it's a surprise that glow products are such big sellers. Glowing novelty products, such as bracelets and sticks, are safer than the common household cleaners you find in a typical home. Your young child is far more likely to be seriously hurt from choking on a small glow toy than by splashing herself with the liquid contained inside. The liquid inside of some glow products is a chemical called dibutyl phthalate. Glow products that don't use dibutyl phthalate use a small glass ampoule that contains a mixture of hydrogen peroxide dissolved in phthalic ester. Surrounding the glass ampoule is another chemical called phenyl oxalate ester. Dibutyl phthalate, widely considered the more dangerous of the above components, is used to manufacture plastics, glues, nail polish, leather, printing inks, safety glass, dyes and is used as a solvent for perfume. "Question: My 7-year-old broke the light stick that goes with her Halloween costume. It splashed in her eye. She's screaming that it hurts. What should I do? Answer: Rinse her eyes with running water for 15-20 minutes. After 15-20 minutes of rinsing, let her rest with her eyes closed. In the meantime, call the poison center." The advice from poison control for ingestion of the so-called glowing toxic liquid chemical is much the same. Rinse your mouth out well, drink a little milk, and call poison control, which will again, stay in touch to make sure you're fine. Poison control encourages people to stay in touch often because different individuals can have various reactions to chemicals. The Children's Hospital of Philadelphia is considered one of the best children's hospitals in the country, possibly the world. The hospital's poison control center reports that, "dibutyl phthalate is not a poison; it is an irritant. The best treatment for any exposure to dibutyl phthalate is water." The following is a round up of the advice the hospital gives for handling contact with dibutyl phthalate. Any foreign substance you get in your eyes will cause irritation. Dibutyl phthalate in the eyes will sting immediately and can cause a burning sensation and tearing. The tearing part is good - it's the body's natural way of ridding itself of chemicals. The hospital recommends washing your eyes out with water for 15-20 minutes and seek medical attention if the discomfort persists. If dibutyl phthalate is splashed on the skin, it will cause stinging, redness, and irritation. Flush with water and soap and later apply cream if the irritation continues. If your child swallows dibutyl phthalate, the substance will cause mouth and throat discomfort and soreness. You should rinse your mouth very well with plain water and then drink a cold beverage. Next, contact the poison control center. Then the hospital recommends ice cream or ice water if any discomfort remains. Animal Poison Control reports that glow products are a low toxicity issue. Glow products may cause intense taste sensations in animals along with stomach upset, but no serious problems occur unless a very large amount is ingested. According to all the best resources available, glowing products do not present an acute danger to children or pets. You should always handle any glow product with care and supervise older children who are using it. Small children and pets should not play with glow products. If a glow product breaks, you do not need to panic, but you should call poison control for more information. To reach poison control, call (800) 222-1222.